Earlier this year, we worked in cojunction with STEM Learning (Science, Technology, Engineering and Mathematics) to run a competition open to secondary school students. The idea was that the participants would design a job advert for their dream job in a range of fields – Animal and Veterinary, Environmental, Farming and Agriculture, Gardening and Botany and other relevant fields. The students simply had to create the poster and refer to necessary qualifications in the relevant subjects (from Science, Technology, Engineering and Mathematics). The competition was open to all secondary schools across Scotland and the response was just fantastic. We had one winner – Eleanor Mackintosh whose advert for a Machinery Engineer won her £200 in gift vouchers and £100 in vouchers for her school – Nairn Academy. 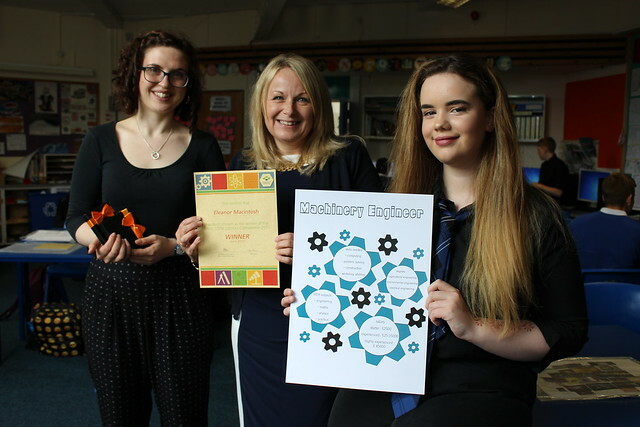 Eleanor Mackintosh receives her award from SRUC Aberdeen MRSO Bridgit Edmonstone (centre) and far left is Jasmine Woodcraft, a Tech teacher at Nairn academy. Our two runners-up, Stevie MacKenzie and Anne Giordano, also won £100 of vouchers for their schools.